Stonechair Cottage, Sennen Cove, West Cornwall. 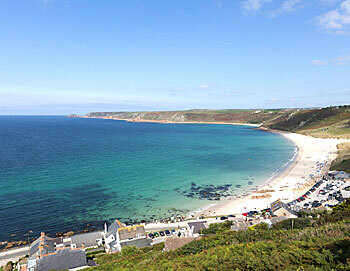 Stone Chair Cottage is located in a fantastic location overlooking Sennen Cove with stunning views of the beach and towards Cape Cornwall from all seaward side windows. The property is being renovated over the winter of 2015 and will be ready for rental from Easter 2016. The house sleeps 6 with two double bedrooms and one twin room. 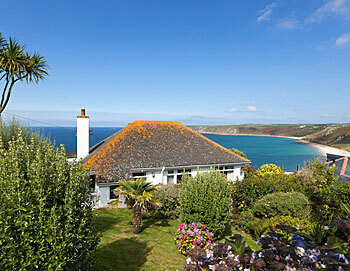 Both double rooms offer sea views with one being on the ground floor and the second upstairs. The twin room overlooks the large, mature gardens. There is a bathroom with bath and a shower over and a separate toilet. The lounge has large picture windows and there is a small dining table in one window for breakfast. There is a sun room leading on from the lounge which is a fantastic place to watch the world go by and relax. The kitchen is well equipped and has a large, farmhouse style dining table. There is a dishwasher, oven and hob, microwave, fridge and freezer. Outside are large, well tended gardens and parking for two cars. There is a path leading down to Cove and plenty of space for BBQs, playing and alfresco dining. Stone Chair Cottage will be the most fabulous location for a holiday and, once refurbished, provide a house which is stylish and comfortable.